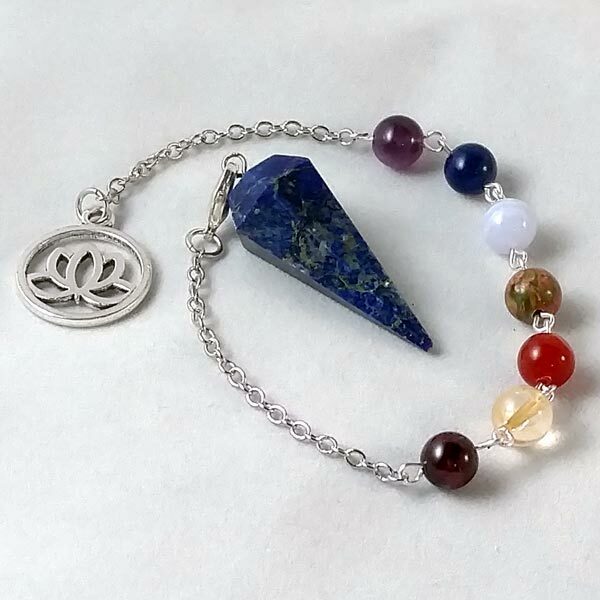 Lapis Lazuli Chakra Pendulum with detachable chain and Lotus Blossom end bead. 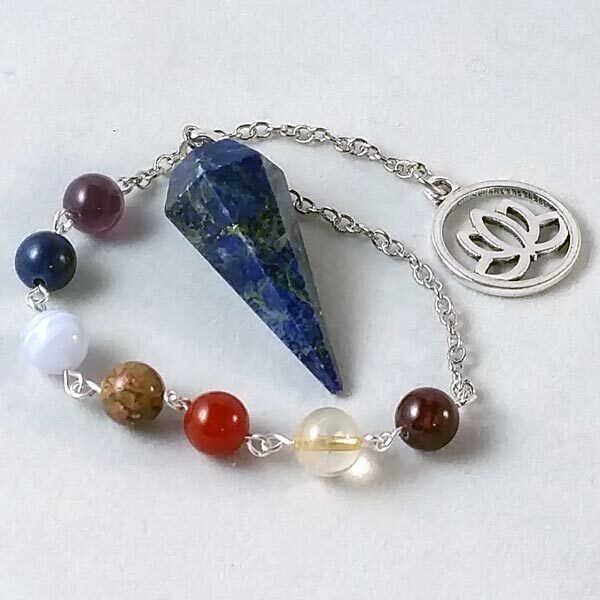 The 8mm Chakra beads are: Garnet, Citrine, Carnelian, Unakite, Blue Lace Agate, Lapis Lazuli and Amethyst. 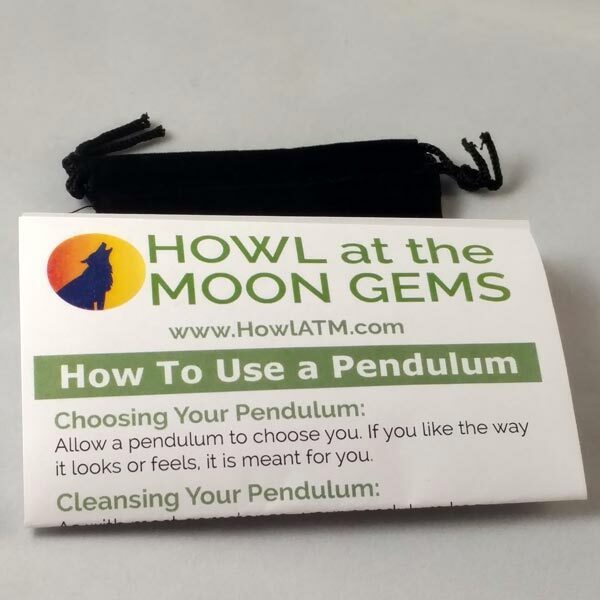 Size: pendulum is 1-1/2" tall and 3/4" in diameter. Overall length with chain is 11-1/4". Lotus Charm is fine pewter (contains no nickel or lead). Includes velveteen pouch and basic instruction sheet. Cleanses the mental body. Promotes deep healing to outdated thoughts and mental patterns. Prevents negative thoughts from becoming karmic patterns and releases worn out karmic patterns for healing. Changes negative views to positive outlooks and reprograms the mental body to facilitate healing. 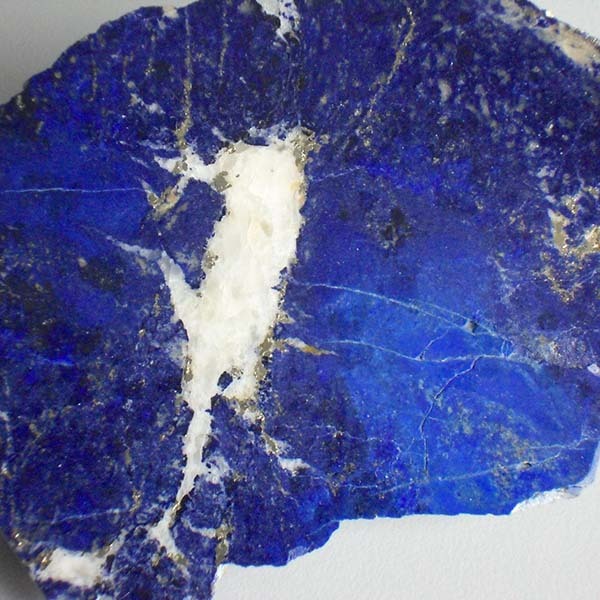 Lapis Lazuli has a cubic crystal system and is in the mineral class of lattice silicate. It is formed during the metamorphosis of chalk into marble. When iron is also present, gold colored pyrite inclusions occur. Scientifically a true stone in its molecular structure as opposed to a crystalline mineral growth. There may be white streaks, clouds or gold flecks of pyrite. To generally increase your physic awareness Lapis would be worn everyday. Or, you may choose to only meditate with it briefly each day to relieve depression and promote spirituality. It is an uplifting, spiritual stone. Lapis bestows wisdom, honesty and reveals our own inner truth. Its blue color relates to water bringing peace, spiritual attainment and serenity. It aids us in being ourselves and liberates us from compromises or holding back. It is one of the stones that can guide you to mental and spiritual purity. Lapis encourages self-awareness, dignity and enables us to enjoy contact with others. It also assists us in conveying our feelings and emotions. Many things in this world distract us from devoting time to harmonizing our inner energies. If these distractions go on for too long, our lives can become unbalanced bringing emotional illness (depression, doubts of purpose). Lapis helps bring things back into balance. Lapis helps us face the truths we may be confronted with and to accept them. But at the same time it still allows you to express your own opinion. It will also assist you in containing conflicts. With Lapis as a guide, you can become more in touch with your essence and play a more active role in the control of your inner environment. Lapis heals problems affecting the neck, larynx and vocal chords. It is also said to lower blood pressure, I believe this would be due to its relaxing and calming effects. It will also help to regulate the functioning of the thyroid gland which when out of balance has been found to contribute to depression. Lapis has a special affinity with Cancer, Gemini and Aquarius, but benefits all signs. It has a Receptive Energy, its Planet is Venus and its Element is Water. Lapis Lazuli has enjoyed timeless associations with kings and queens. In ancient Sumer it was believed that whoever held the stone had the strong magical power of a diety because it was said that the stone held the force behind all divinity. Some even believed the stone actually contained the soul of the deity who would bestow joy on its owner.